People pray at a makeshift memorial for victims of the Oct. 1 2017, mass shooting in Las Vegas. 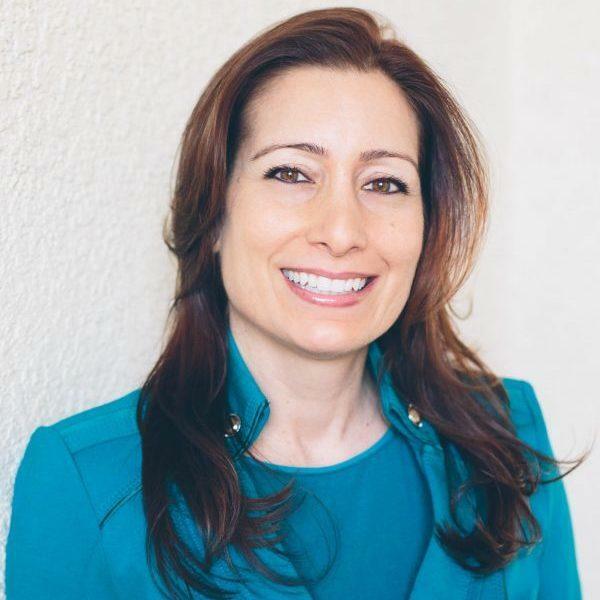 Shiva Ghaed is a clinical psychologist in Southern California. After the Las Vegas shooting, she formed a support group for herself and other survivors. That support group has met most Mondays since the shooting. Its last meeting will be Monday night, on the first anniversary. At first, the evening of the concert was unfolding flawlessly. "It was a beautiful night. It was sort of the perfect temperature: not too hot, not too hot," she recalls. "We were all standing around just socializing." Then that strange and jarring rapid-fire popping sound began, while she and her friends were enjoying country star Jason Aldean. Ghaed didn't think much of the sounds, at first. Someone nearby had been shooting off small confetti poppers. Plus the loud music, lights and glitter. "I mean, it's Vegas, right? So, you know, I mean we didn't know, maybe the show had fireworks or maybe there were fireworks nearby," she says. "Nobody knew what was going on." But the clinical psychologist remembers the moment agitated confusion turned to terror. "When the lights went off on the stage that's when I knew something was not right. And then the floodlights went on," she says. "I thought something had just gone very wrong." The weekend road trip to celebrate a friend's birthday became something else entirely. A reclusive, high-stakes gambler was shooting with semi-automatic rifles outfitted to fire faster from two windows in a high-story suite at the nearby Mandalay Bay resort and casino. Sounds seemed to echo everywhere. "The gunshot sounds kept changing. Some sounded very far away; some sounded like they were coming over the fence and in different directions." Ghaed first huddled under a plastic table that moments earlier had been a bar near the front of the stage. She then moved between some plastic recycling cans, fully aware they offered only an illusion of protection from the ongoing spray of gunfire. She made a dash to some motorized scooters parked near the stage. "I literally sat there, you know, crouched behind this wheelchair scooter thinking over and over again, 'Please, please don't hit me; please, please just don't hit anything vital.' " She recalls just "hoping and praying that the back of that wheelchair would maybe protect my brain and my jugular veins. I know it sounds very scientific, but believe it or not sometimes you have those kinds of thoughts in the middle of a near-death experience." Four people near Ghaed were killed. The group she was with finally made a run for it, stepping over pools of blood and carnage. "We were in the kill zone where over 85 percent of the carnage occurred that night." In all 58 people were killed, plus the gunman, who killed himself. Hundreds more were wounded physically and mentally. It was the deadliest mass shooting in modern American history. Police never found a motive. When Ghaed finally felt safe in a nearby hotel's conference room, she looked down at her Fitbit. "And it was 12:30. So 2 1/2 hours of running and hiding, and running and hiding." Not long after the shooting, Ghaed says, she realized she had a decision to make. "I could try to heal in private — or I could lead by example." The licensed clinical psychologist's work includes extensive experience with combat veterans and military personnel, some with PTSD, in the San Diego area. "I understand the pain and also the very insidious nature of trauma," she says, "the other ways that trauma can manifest into mood disorders and long-term anxiety disorders." Back home a few days later she realized there just wasn't much out there to help people process that night's horrors. "I noticed that there just was nothing in the news about resources, at least in the San Diego area," she says. "You know, I had a couple of sleepless nights probably not unlike anybody else. And I just wakened in a panic thinking about how many people would have invisible wounds." Ghaed called up the manager of local country music bar and dance hall In Cahoots, in San Diego's Mission Valley area. She was a regular there and knew it was closed on Mondays. Could she offer free counseling meetings there on Mondays? The owner and manager said yes. She put the word out through local TV and social media. 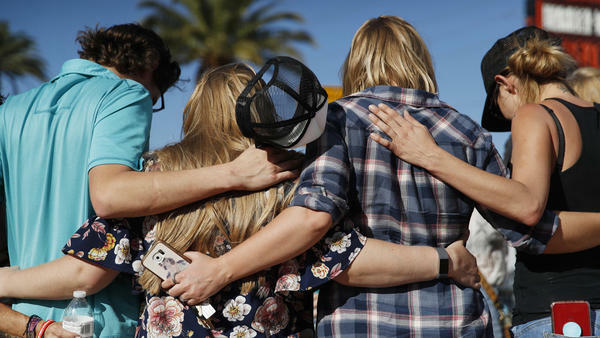 Just seven days after the shooting, she held her first support group — and 42 Las Vegas shooting survivors showed up. "I knew that you have to talk about it. You have to. You have to think about it. You have to face it. You have to feel your feelings about it." Just about every Monday since the shooting, between 40 and 60 survivors have come to the dance hall to meet and talk. "I wanted to intervene quickly and teach people everything I knew about trauma — about PTSD, about depression, about anxiety, about how this develops barriers to recovery," she explains. They meet together before splitting up into small groups of five or six. Ghaed helps guide the sessions and drops in on the small group discussions. The small groups are where, she says, people really open up: Trouble sleeping. Anxiety. Stress. People agitated by loud noises. Some sessions have titles such as "Why Avoidance Makes It Worse" and "Tips on Managing Nightmares." She had survivors coming who couldn't find a psychiatrist or psychologist in their own town and drove up to an hour or more to come to her Monday group. The groups were supposed to be two hours. They often ended up meeting for three hours — sometimes longer. Ghaed soon realized she had lots of blank spots in her own memory. "The first few months were really rough for me. I'm not going to lie." When she began the group meetings, Ghaed didn't fully realize how deep her own invisible wounds were, she says. Ghaed now knew, up close and personally, more of what the servicemen and servicewomen she had treated as a PTSD counselor had gone through. A year on, Ghaed says she realizes she needed the group as much as the participants needed her. "I guess I thought that my expertise and experience in treating trauma for all of these years would somehow protect me or immunize me from the effects of living through a near-death experience. And in fact it didn't, you know?" Ghaed says. They would often end with a circular huddle. "All of us sort of came in together and just gave thanks and gratitude for having each other and being able to heal together," she says. The gatherings, she says, underscore the importance of social networks to help people begin to bounce back. "You know I really strongly believe that we recover and we heal from trauma." The healing won't end for her or scores of other survivors on this anniversary. But the weekly survivor meetings at the dance bar will. There will be a final gathering, a potluck dinner and remembrance Monday night. It won't be a memorial or a celebration, really, Ghaed says, but something in between. Starting now, Ghaed is offering her lessons from the Las Vegas shooting with a free online book and resource links for dealing with mass trauma and violence. One year ago today, a reclusive, high-stakes gambler opened fire on thousands of people at an outdoor music festival in Las Vegas. Police say they still don't know why he did it. It was the deadliest mass shooting in modern U.S. history. Fifty-eight people were killed plus the gunman. Hundreds more were wounded. NPR's Eric Westervelt has the story about one of the survivors, a woman who's trying to help others heal. But first, a warning - you will hear the sound of gunfire in this report. ERIC WESTERVELT, BYLINE: Psychologist Dr. Shiva Ghaed from San Diego was near the front of the stage of the Route 91 country music festival for star Jason Aldean. He was early into his show when that jarring, rapid-fire popping sound began. At first, Ghaed and her friends, who were in town for a girls' weekend, didn't think much of it. Someone nearby had been shooting off confetti poppers, plus all the music, the lights. SHIVA GHAED: I mean, it's Vegas, right? So I mean, we didn't know. Maybe the show had fireworks, or maybe there were fireworks nearby. WESTERVELT: But when the stage lights went out, floodlights came on and the quick-fire, semi-automatic-rifle crackle continued. Ghaed's confusion quickly turned to terror. This is gunfire sound captured on a witness's cellphone video. WESTERVELT: While many people screamed and yelled, Ghaed says, others seemed oddly nonchalant. Sound seemed to echo everywhere. GHAED: The gunshot sounds kept changing and in different directions. And some sounded very far away. Some sounded like they were coming over the fence. WESTERVELT: She first huddled under a plastic table, then in between two recycling cans - more gunfire and fear. WESTERVELT: She then made a dash to some motorized scooters parked near the stage. GHAED: I literally sat there crouched behind this wheelchair scooter, thinking over and over again, please, please, don't hit me. Please, please, just don't hit anything vital. Don't hit anything vital. Don't hit anything vital - just over and over again. WESTERVELT: Four people near Ghaed were killed. The group she was with finally made a run for it, stepping over pools of blood and carnage. The shooting started just after 10 p.m. It took several hours of panic and fleeing before Ghaed finally felt safe in a nearby hotel's secure conference room. She remembers looking down at her Fitbit. GHAED: And it was 12:30 - so 2 1/2 hours of running and hiding and running and hiding. And as I sat in that room, I realized that I had a decision to make, and it was a really important decision. I could try to heal in private, or I could just lead by example. WESTERVELT: She chose the latter. The licensed clinical psychologist has worked extensively with combat veterans and military personnel, some with PTSD in the San Diego area. Back home a few days later, Ghaed realized there just wasn't much out there to help people process that night's horrors and nothing that seemed easily accessible. GHAED: You know, I had a couple of sleepless nights probably not unlike anybody else. And I just - I awakened in a panic thinking about how many people would have invisible wounds. WESTERVELT: Dr. Ghaed didn't realize yet how deep her own invisible wounds ran. She called up the manager of a local country music bar and dance hall where she was a regular. She knew it was closed on Mondays. Could she offer free counseling there? The owner said yes. She put out the word through local TV and social media. And just seven days after the shooting, she held her first support group. More than 40 Las Vegas shooting survivors showed up. GHAED: I knew that you have to talk about it. You have to think about it. You have to face it. You have to feel your feelings about it. WESTERVELT: Just about every Monday since the shooting, between 40 and 60 survivors come to the dance hall to talk. The group's just for them, not the general public, not the media. They meet together before splitting up into small groups of five or six. Ghaed drops in on discussions. The small groups are where she says people really open up - trouble sleeping, anxiety, stress, shaken by loud noises. In between giving lessons with titles such as Why Avoidance Makes It Worse and Tips On Managing Nightmares, Ghaed realized she had lots of blank spots in her memory, things she'd blocked out. The healer now needed her own healing. The PTSD counselor now knew personally more of what the service men and women she'd treated had gone through. A year later, she realizes she needed the group as much as they needed her. GHAED: The first few months were really rough for me. I'm not going to lie. I guess I thought that my expertise and experience in treating trauma for all of these years would somehow protect me or immunize me from the effects of living through a near-death experience. And in fact, it didn't (laughter), you know? WESTERVELT: The healing won't end for Ghaed on this anniversary, but the weekly survivor meetings at the dance bar will. There'll be a final gathering, a potluck dinner and remembrance tonight, one year to the day since the shooting. It won't be a celebration or a memorial but something in between. Eric Westervelt, NPR News. Transcript provided by NPR, Copyright NPR.